For those who are interested in (but not already familiar with) probabilities and statistics, I would most certainly recommand this book. Mlodinow presents the basic concepts of probability and statistics by concrete everyday examples—and visually, whenever possibile, rather than through classical mathematical notation. He discusses psychological factors that make us so bad at estimating probabilities and understanding statistics. The concepts he presents are deep but the style is fluid and makes The Drunkard’s Walk an easy read. […]the human understanding, once it has adopted an opinion, collects any instances that confirms it, and though the contrary instances may be more numerous and more weighty, it either does not notice them or else rejects them, in order that this opinion will remain unshaken. If you own a car, you probably noticed that the speedometer needle’s position varies but relatively slowly, regardless of how the car actually accelerates or decelerates. Unless your speedometer is some variation on the eddy current meter, maybe the noise from the speed sensor isn’t filtered analogically but numerically by the dashboard’s computer. Let us have a look at how this filtering could be done. This is one of the funniest piece of UNIX literature I have come across in a very long time. This book makes thoroughly fun of all the bizarre quirks and general user hostile friendly unfriendliness of Unix and all the stupid things the unexperimented (and sometimes experimented) users can do. Full of FUD and stupidity, this is a classic must read. Not unrelated: Linux Hater’s Blog. This isn’t really a math book; there’s hardly any real math, it’s rather a book about math, or maybe more a book about math in our daily lives, more precisely about things that are indeed solved by maths in our daily lives. The reader needn’t a very high level of knowledge about mathematics to enjoy the read. If it contains several little gems1, it also contains a number of chapters (as each of the 100 things you didn’t know you didn’t know is presented in a standalone chapter) that aren’t all that interesting. Still very much worth the read, though. 1 One I like particularly is the trick proposed by von Neumann to transform a biased coin into a fair coin. Let’s say we have a coin that lands on head with probability and on tail with probability (both quite far from ). Von Neumann observes that if you throw the coin twice, it will land twice on heads with probability , twice on tails with probability . But head followed by tail and tail followed by head have the same probability of . The quantity isn’t , but if each time we throw two consecutive heads or tails we “forget” them, keeping only the draws with one head and one tail (HT or TH), we get an unbiased, or fair, coin. Suffice to map HT to heads and TH to tails (or vice-versa) and we’re done. Winokur gives us the complete irony guide; from verbal irony—the most frequent one, when someone says something while clearly meaning the exact opposite—to auto-irony passing by morrisettian irony (irony mistook for coincidence or something else). You’ll learn a great deal about irony. Plenty of à propos quotes. Not exactly a book for the beach, but not very serious either. Like me, you’re probably dealing with more than a single language at work and on a daily basis. If you’re from the US, it is not unlikely that you are speaking Spanish as well. Here, in Québec, we have English and french coexisting both at work and in our daily lives. Working at a computer, it means that I have two installed locales, one for the US Keyboard Layout and one for the Canada keyboard (formerly known as “Canadian French”) and I cycle between them constantly. The fact that Gnome and Windows are smart enough to assign a keyboard locale per application or window allows me to chat in French in Xchat while coding using the US keyboard layout in emacs without explicitly switching the keyboard each time I switch windows. I’ve been doing this for so long I don’t even think of it. There are moment, though, where this model breaks a the seams. Not all computer cases are equally well designed. That, I’m sure, you know. The thing you may not know, is just how badly designed certain cases are. Not only are they hard to service, they can be detrimental to your hardware! I recently had to change the hard drive from my backup box and ended up changing the whole kit altogether because the old machine did not recognize the new 500GB hard drive. 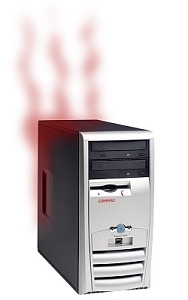 So I reused my old Compaq Presario 6400nx computer, which does recognize the 500GB hard drive, but makes it run very hot. I mean, very hot. The new drive, although almost idling except for the nightly backup scripts and whatnots, got to 50°C. Even if 50°C is within the manufacturer’s expected operating parameters (10 to 55°C, or similar), that’s about 20°C more than my main workstation’s hard drive that runs around 30–35°C. That got me worried because it is well known that high drive temperature shortens its life considerably. So I decided to solve the problem using tie-wraps—no, not à la McGyver. You are currently browsing the Harder, Better, Faster, Stronger blog archives for August, 2009.